Dr. Renee Tucker graduated with her Doctorate in Veterinary Medicine from the University of Tennessee in 1995. She started working in a 3-doctor equine practice. One of her favorite things was figuring out the "mystery" lameness. However, Dr. Tucker was swiftly frustrated at the lack of results with traditional equine lameness diagnostics. Some cases were obvious. But many others were not. Even if joints were injected, or anti-inflammatories prescribed, that wasn't solving the problem. In 1998, Dr. Tucker graduated from Options for Animals with her Animal Chiropractic Certification, followed by her Acupuncture Certification from the Chi Institute in 2000. Adding chiropractic and acupuncture to her veterinary toolbox helped immensely. Yet in her search for solving problems, she has continued to go to many, many additional courses. 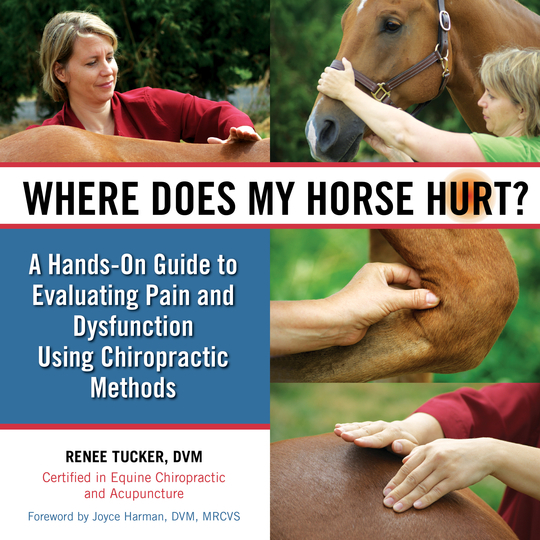 Trying to help horse owners know how to help their own horses prompted Dr. Tucker to write the book, "Where Does My Horse Hurt? ", published by Trafalgar Square. As the book was a great success, Dr. Tucker started to receive emails from all over the world. Horse people from everywhere were asking for advice. They lamented the fact that they had no chiropractic care, or other bodywork either. Or they had to drive for three hours to get to their nearest chiropractor. So many people are looking for help that Dr. Tucker realized more people needed to know how to align horses. Now Dr. Tucker is very pleased to have created the best method for solving horse alignment problems. By combining her learning, experience, certifications, etc. for the last two decades, Dr. Tucker created the Tucker BioKinetic Technique.